SMOVE MOBILE is a 3-axis telescopic stabilizer with a built-in extension for any size smartphones with pro features: auto face follow and object tracking, programmable motion time lapse, intuitive user controls, auto panorama, tripod and extension adapter mount, and advanced customizable user settings. SMOVE PRO superb custom metal build 3-axis any size smartphone/GoPro stabilizer in one, with pro features: auto face follow and object tracking video recording, auto portrait mode, full rotational control for maximum stabilization, tripod and extension adapter mount, and auto panorama. PRO MOBILE military grade aluminum, one click 3-axis gimbal stabilizer for smartphones and GoPro/action cams, with pro features: auto face detect/follow, object tracking, portrait mode, panorama, built-in tripod/extension mount and easy control. 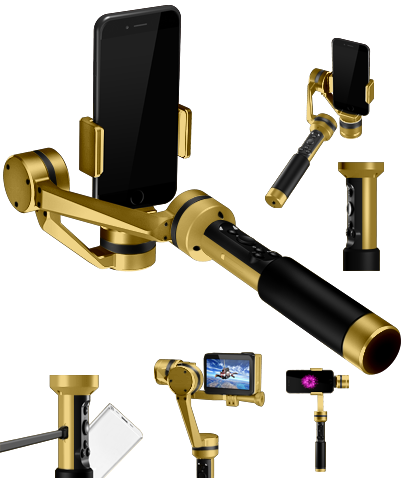 SMOVE PRO GOLD the golden standard of stabilization limited edition superb custom metal build 3-axis any size smartphone/GoPro stabilizer in one, with pro features: auto face follow and object tracking video recording, auto portrait mode, full rotational control for maximum stabilization, tripod and extension adapter mount, and auto panorama.